During its celebrated publication run, Marvel Team-Up featured Spider-Man teaming up with a variety of A-List heroes, such as Iron Man, Doctor Strange, Thor and Daredevil. However, many of the issues presented team-ups with lesser-known heroes, as well as characters of a bizarre nature, including Werewolf by Night, Nighthawk, Paladin, King Kull, Dominic Fortune and the “Not Ready for Prime Time Players” (cast members from NBC’s Saturday Night Live). 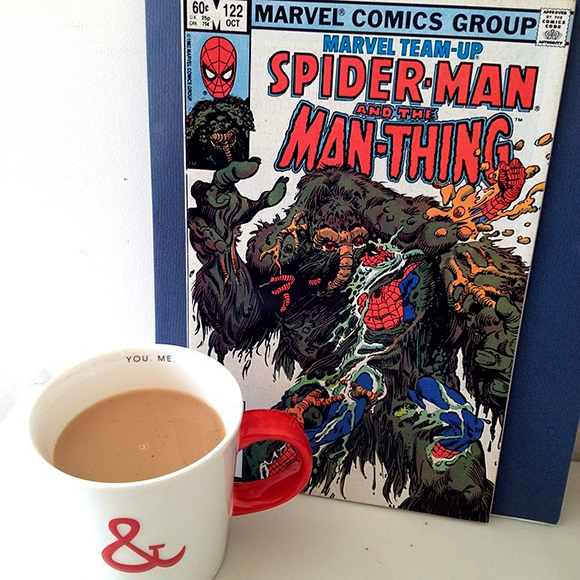 One of the strangest denizens of the Marvel Universe to join Spidey in his continuity-free adventures was none other than Man-Thing! This creature from the swamps of the Florida Everglades used to be a man, but an experimental serum meant to create the next Captain America (i.e. super soldier formula) transformed him into a hulking pile of walking muck without thoughts or emotions. He now and forever roams the swamps, curious of humans he encounters, but hyper-sensitive to their sadness, anger and especially their fear. And many an unfortunate soul has discovered that whatever knows fear BURNS at the Man-Thing’s touch. One day – one of hundreds no different from any other for the Man-Thing, who holds no memory of one moment to the next – from a small tear in reality emerges a disheveled, weary man dressed in fine clothes. The man hovers down to the earth upon a mystically created skimmer and sees Man-Thing before him without flinching. Sensing terrible pain within the deepest recesses of Man-Thing’s soul, the man introduces himself as “Fate” and tells of his origins. The story is a tragic one where Fate was a journalist whose family was killed by an assassin sent by a syndicate boss who was irritated at Fate’s crime exposés. He sought revenge by learning the dark arts and hunting down the costumed assassin, who was being protected by Dr. Strange and The Defenders (Defenders #104). Fate takes Man-Thing’s silence as acquiescence, even friendship, and so the two enter a portal conjured by Fate so they shall help mankind gain freedom from the “vagaries and vicissitudes of this evil world”. Far north in New York City, Peter Parker is showing The Daily Bugle’s City Editor, Joe Robertson and Publisher, J. Jonah Jameson the latest of his photos concerning the plight of forgotten and neglected elderly residents of nursing homes. Peter collects his nice big check and hits the street in search of a “Whopper-with-cheese”. That’s when the reader notices the familiar face of “Fate” who is accompanied by a large figure wearing a hat, scarf and overcoat. With his spider-sense alerting him to something suspicious, Peter ducks into a restaurant’s restroom and makes a quick change into his alter-ego, the Spectacular Spider-Man! Meanwhile, inside the Daily Bugle, J. Jonah Jameson has been spotted and is called to by an old friend. “Ian? Ian FATE?”, he responds, and we learn that Fate came to the Bugle 15 years ago looking for a job and is remembered for Pulitzer prize-winning stories. Just when Jonah’s ears perk up at the notion of another super-selling story from renowned reporter Ian Fate, that’s when Fate dispels the disguise of his companion, revealing the monstrous Man-Thing in the middle of the Bugle’s City Room! Panic immediately ensues and Man-Thing responds to the fear building all around by going berserk. Just as Man-Thing is about to place his burning touch upon a woman huddled in a corner, Fate halts the spread of fear by placing everyone in the room in a petrified state, except for Fate, Jonah and Man-Thing. While this is happening, Spidey scales the exterior of the Bugle and is stunned when he looks in the City Room window to see Man-Thing hovering over the two men inside. Fate proposes that Jonah use the power of the media to teach people to “be decent, to reach out to each other…stop all the killing …the hurting”. It’s then that Jonah offers up a refusal that comes across as downright inspiring: “Don’t you think I’d love to wave my magic wand and make all the horror and ugliness go away? A journalist’s responsibility is to report what IS — not what COULD be. That’s for the poets and dreamers. If I went along with you on this, I’d not only be laughed out of the business — I’d corrupt every journalistic principle I ever held dear!” Fate’s response is a bit less inspiring as he socks Jonah in the jaw and sends him to the floor. That’s all Spidey needs to swing in through the window and call Fate’s attention away from the fallen newspaper publisher. Fate sees Spider-Man as a costumed assassin like the one who killed his family and lashes out with a mystical bolt of eldritch energy which the wall-crawler easily dodges with his spider-like agility. Our hero’s webs prove ineffectual against Fate, who disintegrates them upon contact with a sorcerous spell, and that’s when things start to go even more haywire! Fate’s dark and violent emotions have attracted the attention of Man-Thing, who grabs Fate from behind. It would probably be a simple matter to free himself with his magic, but the powerful embrace of the muck-monster brings upon Fate a new emotion…fear. And as we all know, whatever knows fear BURNS at the Man-Thing’s touch! Spidey leaps into action. Even though the man was attacking the web spinner mere moments ago, our hero can’t just stand by at let him burn to death. Lunging atop Man-Thing’s shoulders, Spidey attempts to pull him away from Fate only to lose his grip because of the slippery slime covering the creature. Suddenly, the Man-Thing shifts his attention to a source of fear even stronger than Fate’s…J. Jonah Jameson! Just before he reaches the cowering newspaperman, Spidey leaps full force at Man-Thing, sinking his arms deep within the monster’s muck yet hitting him with enough force to send them bursting out of the side of the building — 20 stories above the ground! As they plummet to the street below, Man-Thing remains unaware of the impending peril, but Spider-Man does not. With all of his might, he yanks his arms out of the creature’s dense gunk and barely has time to shoot a web-line to safety before Man-Thing splatters all over the sidewalk! Web-head lands near the mess that used to be Man-Thing and begins to mourn the sad ending to this contest when, all of a sudden, he witnesses the streetside slime begin to re-form, stand upright and shamble down the street surrounded by terrified passersby. With a heavy heart, Spidey dives after Man-Thing before he can reach innocent pedestrians. Even though the creature is weak and wounded, Spider-Man’s forceful blows have no effect and Man-Thing grabs the wall-crawler and slams him down to the unforgiving pavement. With his senses disoriented, Spidey narrowly avoids a devastating blow and rights himself to continue the battle and prevent a continued rampage. Spinning a super-strong layer of webbing around the Man-Thing, he successfully pins the creature’s arms and prepares to go check on the welfare of those back at the Daily Bugle. Before he can even finish that thought, however, Man-Thing begins oozing through Spider-Man’s webbing and quickly swats our hero into a nearby bus. High above in the Daily Bugle’s office, Jonah has been speaking to Fate about his family. What would his wife, his children, think about what he’s doing today? Fate realizes the truth of Jonah’s words, has a change of heart, and hovers down to the street below. Spider-Man struggles to stay conscious while police officers have arrived and begin to unload their pistols and shotguns at Man-Thing. The Man-Thing is growing weaker by the moment. All the time spent away from the life-giving marshland has dried him out and the weapons fire has more of an effect now than it normally would. Still, his massive strength allows him to easily overturn a squad car, which falls right in the direction of a pair of cops, only to have Spider-Man swing in at the final moment to pull them to safety. Web-head pulls the last dregs of strength and will from the pits of his soul and launches himself toward Man-Thing, punching wildly and fighting on despite his incredible fatigue. Man-Thing falls to the ground, dying and missing much of his mass due to evaporation. As Fate finally arrives at the scene, he believes that he has returned too late and that his friend is dead. However, Spider-Man points out that the mass of swamp muck on the pavement still has some movement. Fate mystically teleports the two of them back to the Everglades swamp where Man-Thing will make a full recovery. Spider-Man collapses into unconsciousness and someone cries out for an ambulance. The issue concludes with Spidey’s fate in question and Man-Thing’s friend – Fate – vowing to help him with his curse. One can easily ask the question, “should it still be called a ‘team-up’ if the characters never actually team up, but merely fight each other?”. But there is much more going on in this issue than mere semantics. The theme of human misery and compassion runs throughout the book, ranging from the plight of elderly residents of nursing care facilities to the anguish Spider-Man feels when he thinks he has killed Man-Thing. The artwork of Gammill and Esposito has some strong moments. When Fate begins to call forth his magic to hurl against Spider-Man, there is human posing and expression not unlike images by Gene Colan, and certain action scenes bring forth hints of Michael Golden. I’m curious what follows this issue for both characters. Are there future stories where Fate attempts to help Man-Thing in some way? Does Spider-Man get sent to the hospital for his injuries? And, if so, do the paramedics or nurses take off his mask? But that’s what I loved about comics during the Bronze Age: they made you wonder things which came before or after the single issue in your hands. It’s what hooked me into comics. I hope you all had a wonderful Memorial Day and Fare Thee Well! Marvel Team-Up #122 is written by J.M. DeMatteis, penciled by Kerry Gammill, inked by Mike Esposito, lettered by Diana Albers, colored by Bob Sharen and edited by Tom DeFalco, with a cover by Ed Hannigan and Al Milgrom (1982).